QME consists of the major clauses of ISO 9001, which allow different departments at a company to implement them with less direction from management and without risking the fundamental concepts of ISO 9001 structure. 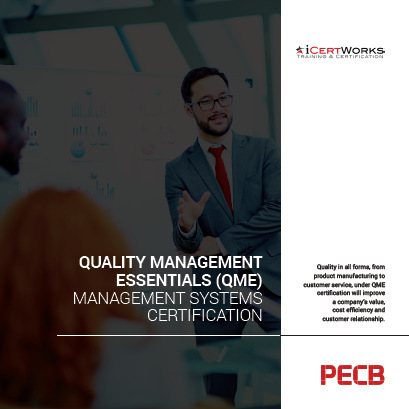 Implementing PECB's QME framework and obtaining the certification for your organization is the right decision towards demonstrating the ability of practicing quality management and addressing the challenges involved in an efficient way. QME certification (also known as "registration") is granted by a third-party, such as PECB, upon verifying through an audit that the organization has fulfilled the considered essential clauses. This certification is then maintained through scheduled annual surveillance audits by the registrar, with re-certification of the Quality Management Systems performed on a triannual basis. For more information on QME Certification, please fill out the form on the right side of the page. Contact us about QME Management Systems Certification! Looking for ISO 9001 Certification?